To study cooperation and punishment, the scientists created a computer simulation of a population in which each interaction leads to either a good or bad reputation; cooperation leads to a good reputation, while not cooperating leads to a bad one. Players could then choose whether to cooperate, punish, or opt out of interactions with another player—based on their observations of the other person and information about the person’s past decisions with other players. “Our behavior toward other people depends not only on what they have done to us but also on what they have done to others. 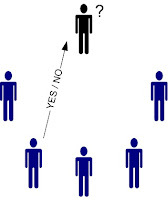 Indirect reciprocity works through reputation,” the researchers write.